Gave a talk and demonstration on his painting techniques. Thumbs up to Monique Verdier and Elise Zylinsky for showing up at the event on the Sunday. It was sunny but a bit cold for oil painting, only Gisele prefered to stay outside to paint. Elise and Monique were welcomed inside a warm hut to paint and sketch. Hot dogs and coffee were available on site, and beer!!!! 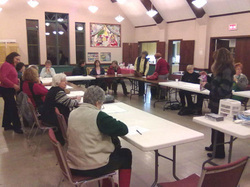 The Hudson gazette was on the spot talking pictures. 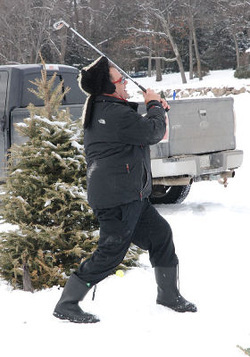 Derek Halbert was on the ice but instead of a brush he elected to use a golf club. 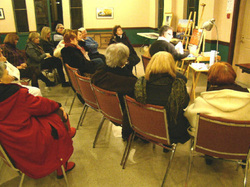 Participants were given the opportunity to try this medium out. 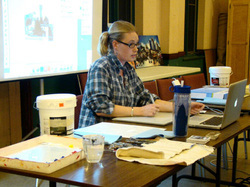 Gave a demonstration of her work at different stages in her mixed-media process. 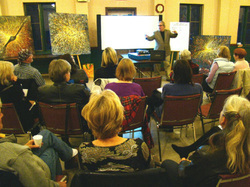 "The Idea of Abstract Art", presented by AHA member Barry Melsom, was a fun evening, defining what is meant by 'abstract art'. There were some paintings as well as projected illustrations as reference with audience participation in a light-hearted debate and an opinion of the 'core' of abstract ideas and how they relate to art.